Stylish Star Allu Arjun's forthcoming film shoot titled Sarrainodu has wrapped up the shoot recently and the film unit has recently announced that the audio songs of Sarrainodu will be releasing directly on April 1st without any audio launch event. 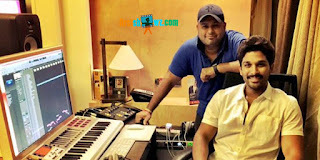 Now the latest news from the Music Director Thaman confirms that Allu Arjun is planning to promote the film in unique way where the promotions will soon start with official announcement from the makers. "Tat was an awesome day at work with our #Alluarjun. super promotional plans of the #Sarrainodu audio coming soon" informed Thaman. Sarrainodu has Rakul Preet and Catherine Tresa as the leading ladies and Actor Aadi will be seen as protagonist in the film. The film also has Srikanth, Jaya Prakash Reddy in crucial roles. Boyapati Srinu has directed this action entertainer and produced on Geetha Arts Banner by Allu Arvind. The film is slated for April 22nd release worldwide.